In a follow-up to this request, the City Planner replied that such a name change is not easily done for a number of reasons. 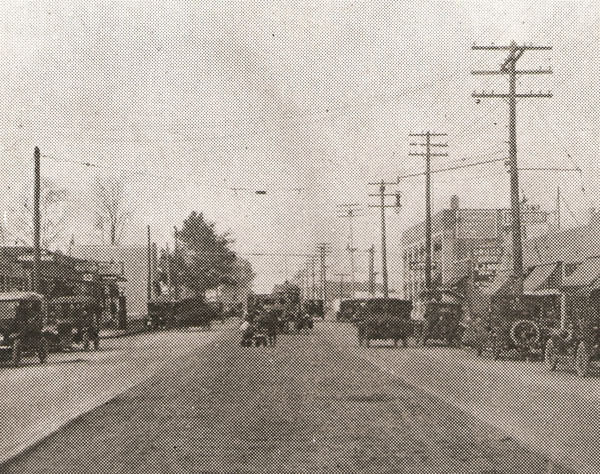 Livernois Avenue is an old historic name representing early settlers and the street goes beyond the limits of the City of Detroit into Oakland County. There is also a concern that the business and property owners would incur considerable expense to change their stationery as well as confusion in the delivery of mail. Rev. McNichols thanked Mr. Burton for his information, but still was not convinced that the Livernois name should be kept. “But to have the insinuation of decayed meat cast into your face every time the place of your residence is mentioned is really hard, even for a humble and unassuming University President.” He also contended that “Varsity” was a valid word and had a more English flavor than “University” and since he was Irish, would like a name with an English flavor. So then he asked if “Pere Richard Highway” as the name would work. 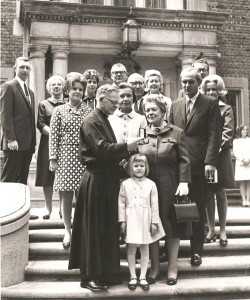 Mr. Burton replied that Father Richard had already been honored by the city by placing his name on a branch library. The discussion about changing Livernois to a different name comes up again in 1932. Rev. John McNichols had retired from active presidency on April 7, 1932 to enter Ann Arbor Hospital. A few weeks later a cold developed which further undermined his health and he passed away April 26, 1932 at the age of 57. This time the request was made to change Livernois to McNichols Road. There are letters of protest from some of the businesses on the expense and confusion that would be created by changing the street name. There is one letter, however, from a representative of the Livernois family that suggests that instead of changing the Livernois name to McNichols, that it would be better to rename Six Mile Road to McNichols Road in memory of Rev. McNichols. Although I have not been able to find when that name change became official, no one seemed to have any objection to calling it McNichols Road instead of Six Mile Road. So maybe Rev. McNichols can rest in peace that the official address of the the University of Detroit Mercy is 4001 W. MCNICHOLS Road to mitigate his distaste of a “Livernois” street name. Over the past few weeks, as part of a grant, I have been sitting in on interviews with some of the Sisters of Mercy who were connected in some way with Mercy College of Detroit. In the early days, Mercy College of Detroit was not only a school for all young women to receive a liberal arts education for nursing or education, it was also a place where women would begin their education to enter the order of the Sisters of Mercy. The stories have been inspiring, touching, humorous, and for me a realization of just how unselfish and service oriented the Sisters of Mercy are to helping the poor, sick, and those in need of a good education. After the interviewing sessions have been completed, the stories will be posted (video/audio and/or text) for anyone to see on the library page. One of the things that gets mentioned a lot by the sisters is how they felt about the change from the traditional habit to the modified habit (which the sisters used for only a short time) to the secular fashion that is worn today. So far its been pretty unanimous that they were glad to see the old habit go away. 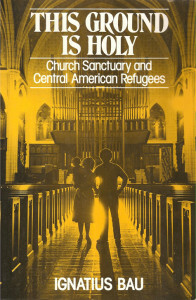 The changes started in the mid 1960′s, not long after Vatican II. Those habits were made from black serge material (about 9 yards worth!) and it gets very hot to wear during Michigan summers which can get pretty brutal, especially at a time when not a lot of buildings had air conditioning. 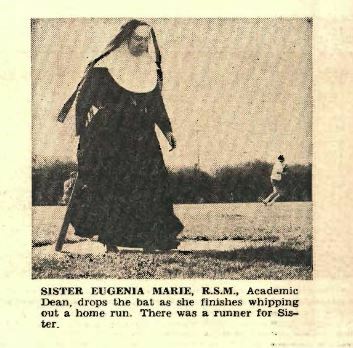 You have to admire those nuns wearing those heavy black habits; they would just hitch them up and get right down on the ground with the kids and play marbles or whatever activity they participated in where all that extra material would be a problem. All the sisters were asked: “Why chose to join the Sisters of Mercy over another order?” The common response, aside from having them as teachers in grade school; they saw a lot of joy and humor in the group. As one who has not had a lot of contact with religious communities, I had a very stereotypical view of nuns and any form of the term “fun” is not something I would have associated with the Catholic church. After listening to the stories from the sisters, if I were trying to decide which order to join, I would have gone for the Sisters of Mercy too. I am looking forward to sharing the many stories we have recorded so the public will get to know these amazing Sisters of Mercy. Their commitment to the mission started by Catherine McAuley is something that I think gets overlooked and needs to be recognized. 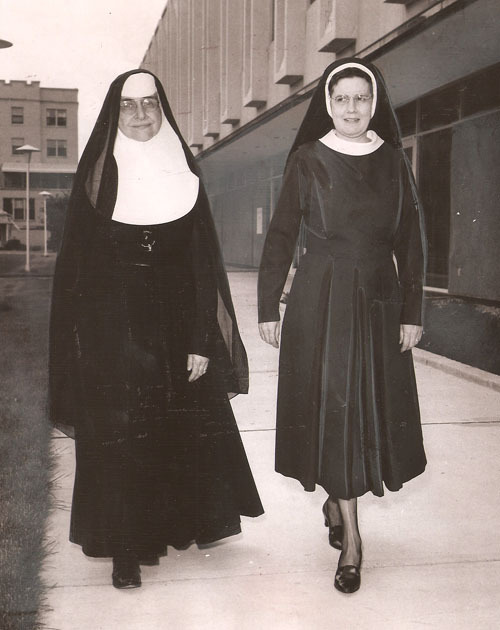 Our project to archive and preserve these memories will make sure that the Sisters of Mercy associated with Mercy College of Detroit will never be forgotten. 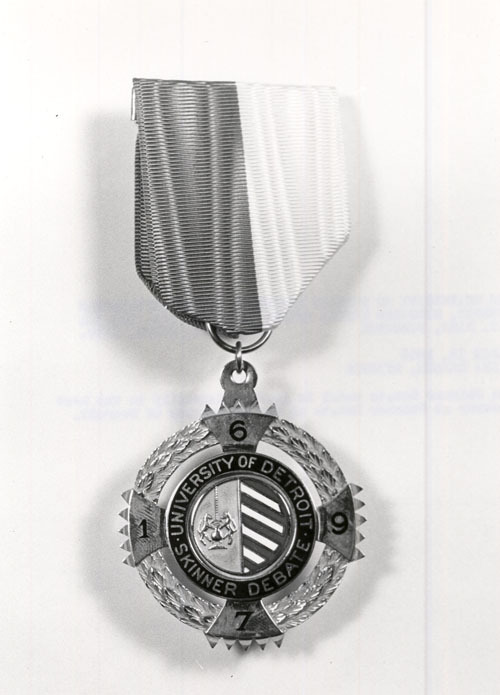 The University of Detroit had a debate program almost from the beginning of the university’s establishment. It started out under the Philomathic Society until 1924 when the debating team was organized under the Department of Public Speaking. 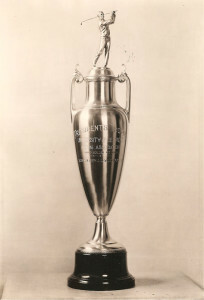 One of the longest running contest was for the Skinner medal. The Skinner Debate was founded in 1897 by Henry W. Skinner, a resident and citizen of Detroit, who donated $1,000 to the University of Detroit Philomathic Society, a group fostering the reading and appreciation of good literature, and encouraging proficiency in eloquence. 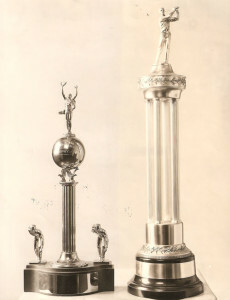 The Skinner Debate format: “The debate [was] conducted in the Parliamentary style, similar to that employed by the Oxford Union and other debating societies. Speakers appear as individuals, not as members of teams. Contestants are allowed to choose their positions. Each one will make a 10-minute constructive speech and a 3-minute rebuttal. 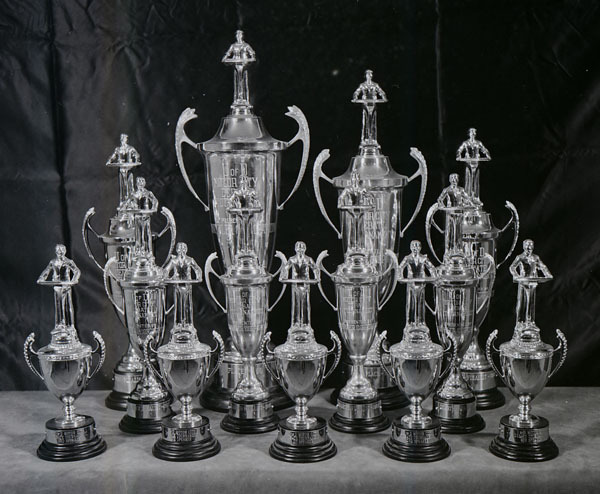 Initially the Skinner competition was just for UD students, but in 1966 it changed to an intercollegiate competition with other universities. To the great disappointment of many, the debate program as part of the Speech Department was downsized in 1971 because the university was undergoing some financial problems. Initially, many people thought the entire Speech Department was being eliminated and there are a few letters in the file expressing their concern that such a drastic action was being taken given the success of the debate program. 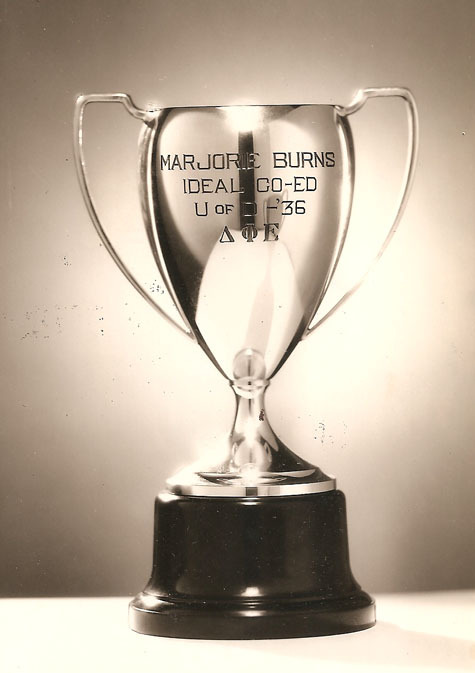 The university continued the Speech Department, but its participation in various debate contests at the intercollegiate level seems to have ended around the 1975-76 academic year. Although there is no debate contests at UDM currently, there is now in a similar activity, the Ethics Bowl-but I will leave that for another blog. Although it was called the “President’s House”, it was not the residential place where UD’s president lived. 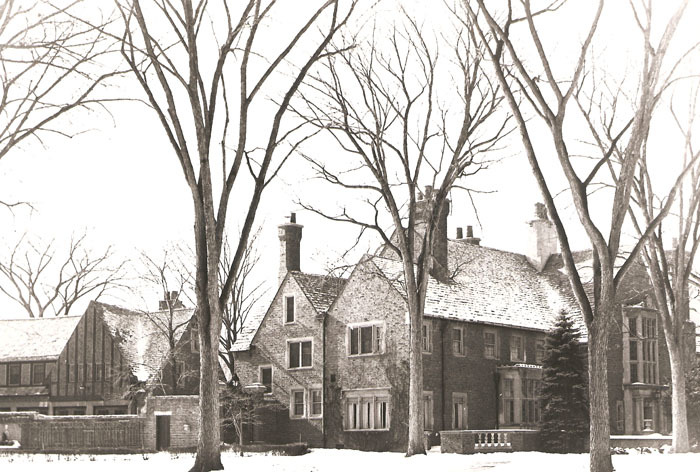 The mansion located on 1771 Balmoral Drive in the Palmer Woods district was donated to the University of Detroit in 1968 by Mrs. Alfred J. Fisher. Since there was already a building on UD campus called the “Fisher” building for administrative services, they did not want to have people confused as to which “Fisher” building that a meeting was being held. The President’s House was used to hold religious activities for small groups, high level academic affairs, and conferences for professional groups, faculty and administrators of the university. It would not be used for fraternity or student government affairs, dances or parties. 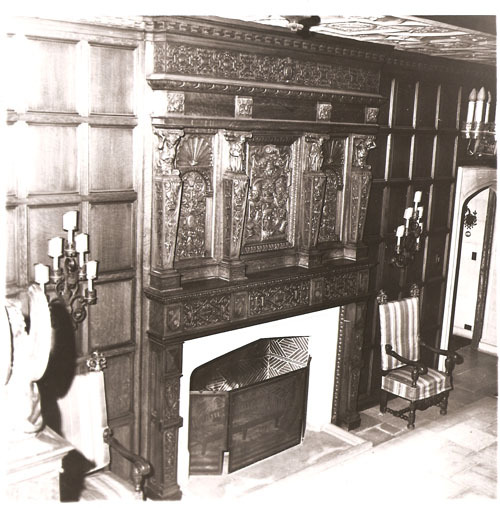 The mansion had 16 rooms suitable for meetings, a chapel, ballroom, and game room. A separate building housed an all-weather swimming pool. The number of people that were to attend an event at the President’s House was limited so as not to interfere with the residential nature of its location. Car pooling was strongly encouraged. At the time of the donation the value of the house was listed as $350,000. 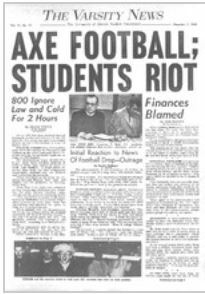 The university sold the property in 1975 for $67,000 on a land contract. The annual expense of maintaining the property of about $15,000 (which included a live-in caretaker, and heat), was just too expensive for the university. A couple bought the property, however there are letters in the files to indicate that they didn’t keep up the payments of $500 a month after a couple of years, so it sounds like the bank had to take over the property. 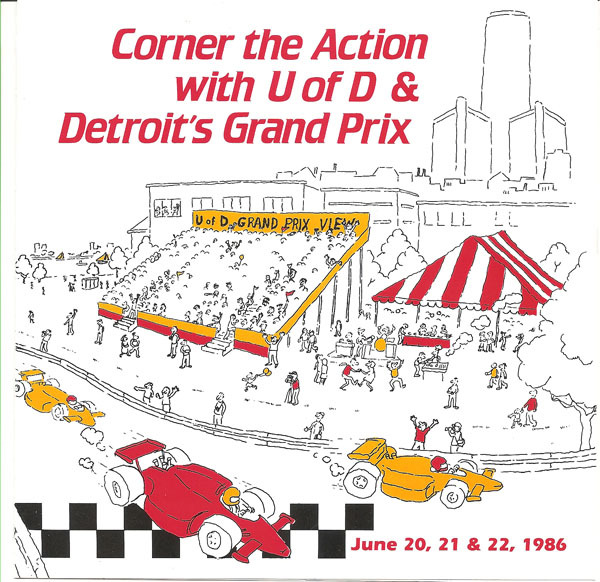 The first few years when Detroit held the Grand Prix, the race course route was through downtown Detroit, right past the University of Detroit Law School campus. There were a lot of problems running Formula One cars through the narrow streets and eventually they moved the venue to Belle Isle. 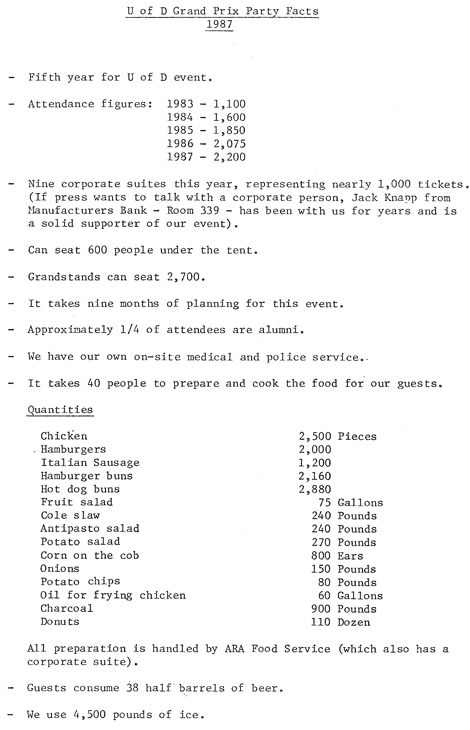 However, while it was held downtown, the university took advantage of its location for fundraising and public relations. 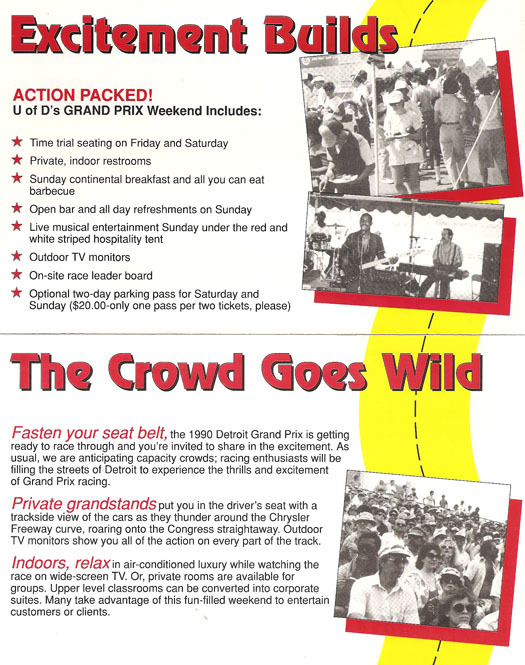 It took nine months of planning for three full days of racing to provide food and entertainment for all the UD guests during the event. In looking for stories to write in this blog, I would often go to a file and just look for something with pictures. The file on trophies did not have a lot, but in trying to check into one of them found a bit of a mystery. All the trophy pictures appear to be taken around the same time-mid 1930′s. The two tall ones don’t have any names or identification inscribed on the nameplate, one can only guess that they have something to do with golf and track and field. Only because there is another golfing type trophy that has “Presidents Trophy, University of Detroit, Alumni Association” label and I think it says “John P. Scallen Award” that would lead me to think that the two unidentified trophies might also be connected to the Alumni Association. John P. Scallen was a prominent alumni and major booster of the UD athletic department. At least during her freshman and sophomore year, she was one very active student in various student organizations. 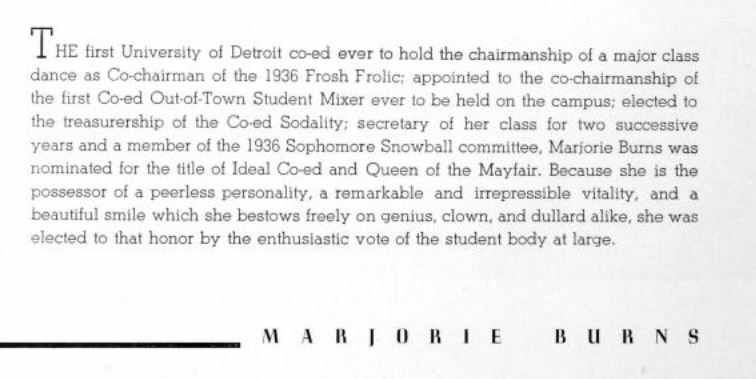 The 1935 and 1936 Tower Yearbooks have quite a list of activities that she participated in as more than just a member- she held some important leadership roles and in a couple of cases the first co-ed to to take on those roles! 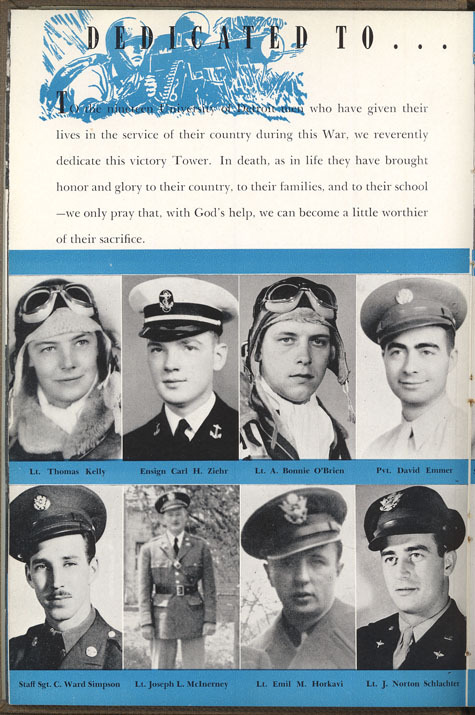 But at least as far as the Tower Yearbook goes, the only other listing for her is as a senior in the 1937 Tower Yearbook and then only her name, no picture. Did she double up on credit hours during her junior and senior year-which left no time for any student activity? Did she even graduate? 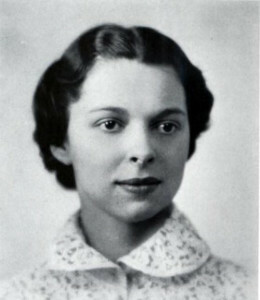 Her name is not listed in the commencement program for 1937 or 1938. Did she graduate under a married name? So what happened to the “Ideal Co-ed”? Maybe they were one of the 8500 who attended one of the last public appearances of Robert Frost at the Memorial building in November 1962. Listen to Johnny Mathis at the 1963 Spring Carnival sing “Misty”. Remember where they were when they heard the news that President Kennedy had been assassinated, November 22, 1963. February 1964, Basil Rathbone gave a lecture and reading of some poetry and dramatic scenes at Mercy College of Detroit. 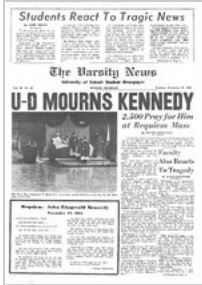 Its been 50 years since UD announced the end of varsity football. Unhappy students took to the streets to express their anger. Students at Mercy College of Detroit put on a production of the “Sound of Music” in March 1965. It was directed by Albert Zolton, faculty member of Mercy College. How many students at UD would know that if they had an English class with Mrs. J.O. 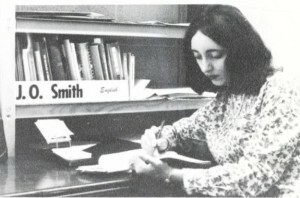 Smith, as the instructor, that she would become better known as Joyce Carol Oats, famous author of such novels as “them” which won the 1970 National Book Award for Fiction. So what memories will the Class of 2015 have fifty years from now? Congratulations and Best Wishes for University of Detroit Mercy’s Class of 2015! 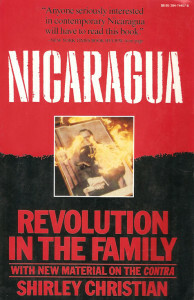 Housed in the University of Detroit Mercy Archives is a collection of documents, media and books related to the conflicts in Central America, mainly during the 1980′s. Fr. 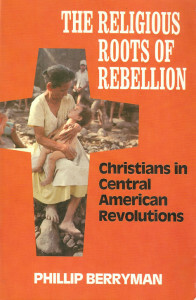 James Guadalupe Carney, who attended the University of Detroit before deciding to become a Jesuit Priest, worked extensively among the poor campesinos in Honduras until he was expelled in 1979 for his activities organizing cooperatives. 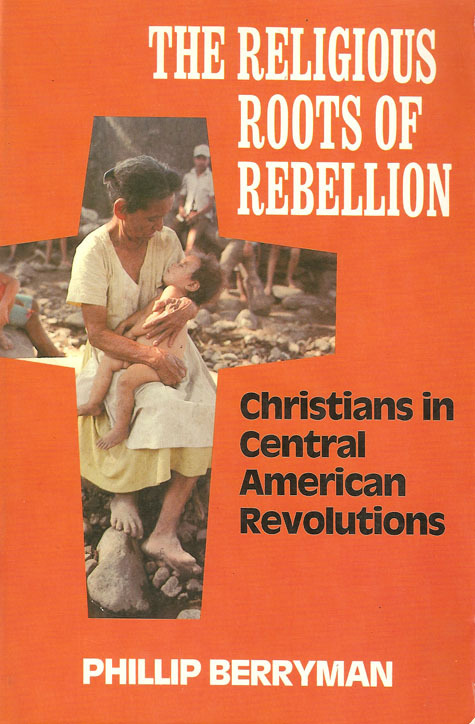 Later, in 1983, he “disappeared” while serving as chaplain to a revolutionary army which had just crossed the border from Nicaragua into Honduras. 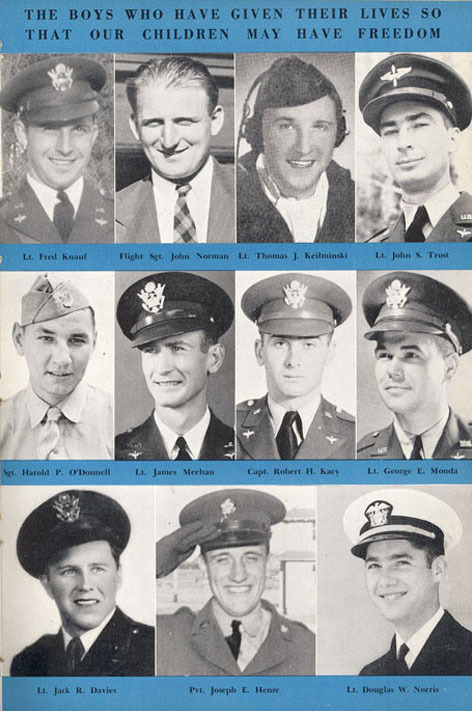 Documentation collected from the Freedom-of-Information Act (FOIA) and other correspondence with the Federal government by family members to locate their missing brother is part of the information housed in the archives. 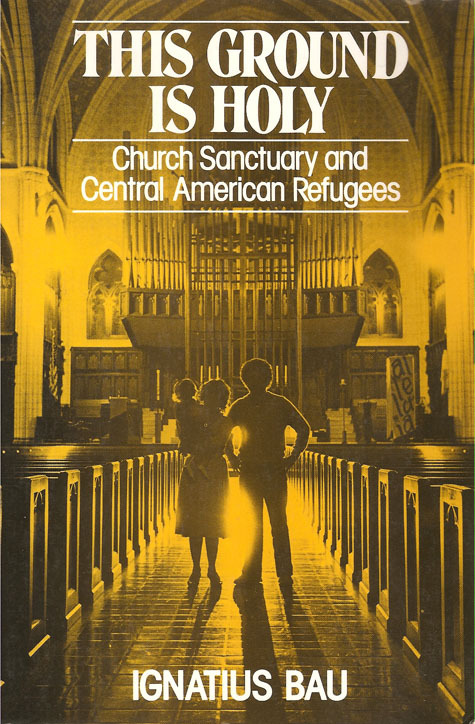 The archives also serves as a resource for the former Michigan Inter-faith Committee for Central American Human rights (MICAH), the Central American Solidarity (CASC) and the Organization in Solidarity with Central America (OSCA). 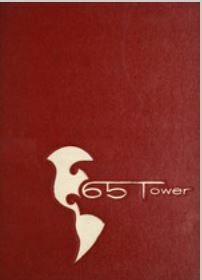 There is a large collection of reports, bulletins, newsletters, journals, ephemera, films, etc. 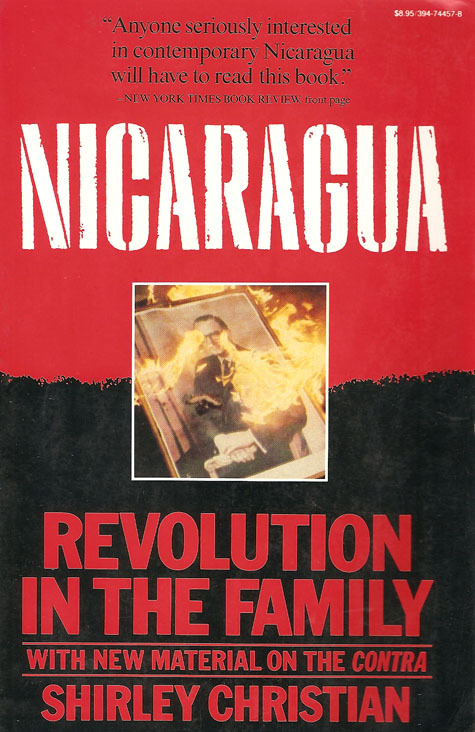 most of it from the 1980′s about issues in Central America. There is a special collection of books on the politics, philosophy and religion affecting Latin American culture and history housed with the documents. 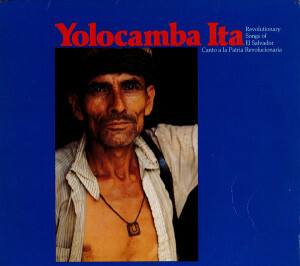 All material in the CLASA Collection is open to the public by appointment. In addition to the CLASA collection, the UDM sponsors a number of events on campus, bringing in speakers to discuss events and issues about Latin America. 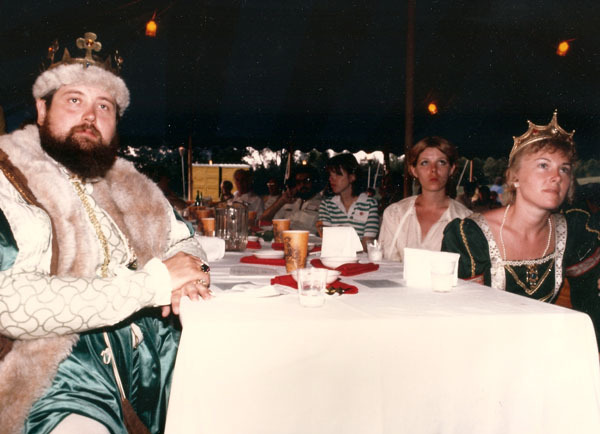 In all the other photos in that file, people are dressed in formal black ties and gowns in a setting of a banquet room, so where should this picture be filed? I have absolutely no idea! Pretty sure it has nothing to do with the Presidents Cabinet. Then there are those pictures with some vague label “1980′s” and you can tell the location – in this case in one of the rooms of Mercy College’s Ward Conference Center. 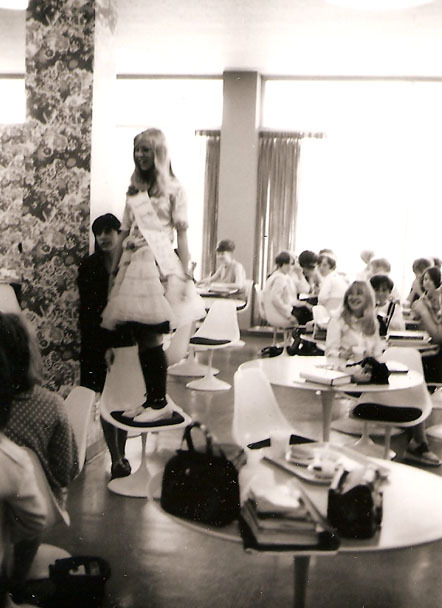 But what is the girl doing standing on the chair wearing a dress of some sort like she is rehearsing for a beauty pageant with that sash? Then there is always the question as to who took the picture and how did it end up in our files? I suppose now with everybody owning phones that takes pictures, there will be billions of pictures that in a few years, will be as much of a mystery as these are today.